Data Discovery is defined as end users’ ability to use Big Data tools and platforms to access data from many different sources, aggregate and combine data subsets from these data sources, and analyze them to identify unknown patterns and trends. It’s also a way for end users to find insights particular to their role, perhaps in a search for a pattern that a business intelligence (BI) analyst did not have in mind. Data discovery also eliminates the need for end users to learn complicated and cumbersome tools in order to interact with data, and allows for real-time analysis without the need for cubes or pre-built data models. For companies looking to analyze and integrate massive volumes of raw data generated from and residing in multiple disparate sources, data discovery can enhance the way enterprise data is accessed and used for strategic planning. Poised to significantly reshape industries from healthcare to retail to professional services, Big Data remains a cumbersome, process-laden and time-consuming function that is highly dependent on skilled data analysts and scientists. Enterprises have yet to find a new path of converting their messy data into well-structured Business Intelligence (BI) that would enable business continuity, operational efficiency and user loyalty. Oracle is wondering whether Big Data is fact or fiction and whether it can really be turned into a solid competitive advantage. Right now, the Big Data landscape is confusing and over-hyped, with many enterprises lacking in-depth understanding of how to collect, store, query, analyze the data and benefit from identified trends and business insights. New approaches and BI tools are needed today in order to allow for free-form exploration and end-to-end functionality; most of Big Data tools available now are geared towards the notion that user knows in advance what questions they want answered by their Big Data and predictive analytics initiatives. Data analysts have to deal with different tools, which generally disrupts their work and inhibits agility. Our new white paper aims to explain the process of converting data into BI insights and help business decision makers evaluate their Big Data efforts and define the right strategy of turning raw data into visually attractive charts of easily understandable and, what’s more important, precise information. 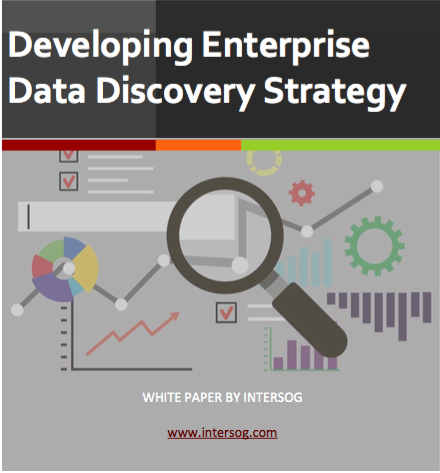 Request your copy of our "Developing Enterprise Data Discovery Strategy" white paper now!